I initially created this for the Colour Challenge but when I heard Lesley was going to have sea themed shows on The Craft Channel this week I thought that I would send it in for her. It certainly stands out on TV! I definitely would like to make another of these but in more dreamy colours next time. Here is another project created for the Chocolate Baroque Colour Challenge 24. I am a little unsure about this one but it is certainly Fairy tale and vibrant. If I made it again I think that I would make the sea colour and the mermaids little paler. This would give a little more depth and less clash. · Underwater, Underwater Kingdom, Sea Dragon and Mermaid Queen stamp sets. · Spectrum Noir Aqua markers, glitter pens. · White card, yellow card (for die cuts), glitter card (orange), white stamping card. · Zig 2 way glue pen. · Midas touch gold foil (for cold foiling with glue). · Inkpads: Versafine (Onyx Black) and dye based (violet). · Stickles glitter glue (Diamond). 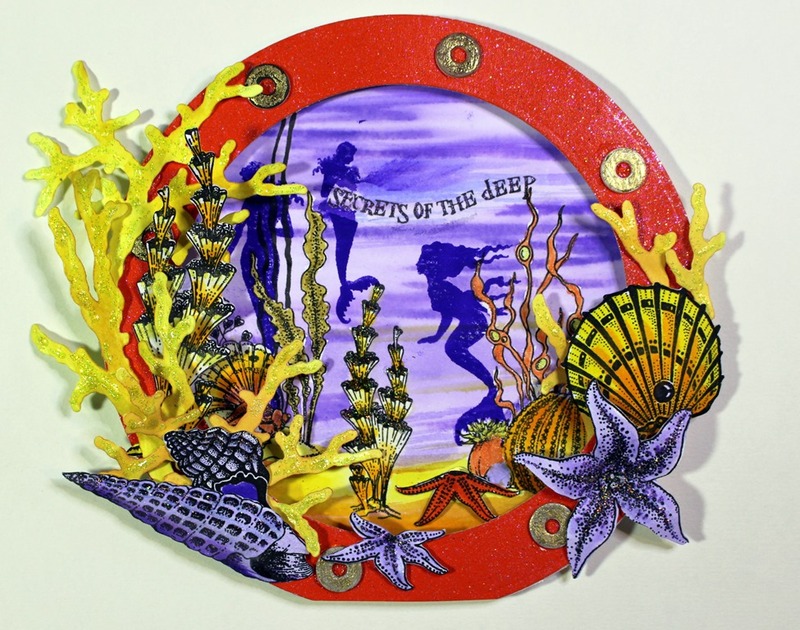 This entry was posted in Card Making, Chocolate Baroque, Die Cutting, Paper Crafting, Stamping, The Craft Channel and tagged Card Making, Chocolate Baroque, Mermaid Queen, Seadragon, Stamping by annewaller. Bookmark the permalink.